For the current entity named United Mexican States, see Mexico. The United Mexican States in 1853. 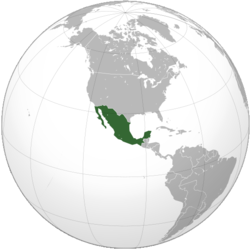 The Second Federal Republic of Mexico (Spanish: Segunda República Federal de México) is the name given to the second attempt to achieve a federalist government in Mexico. Officially called the United Mexican States (Spanish: Estados Unidos Mexicanos), a federal republic was implemented again on August 22, 1846 when interim president José Mariano Salas issued a decree restoring the 1824 constitution. Like the Mexican Empire, the First Federal Republic and the Centralist Republic it was a chaotic period, marked by political instability that resulted in several internal conflicts which comprised the Reform War. Other events during this period were the dictatorship of Santa Anna, the sale of the Mesilla Valley and the promulgation of the Constitution of 1857. During this period, there were two international conflicts: the conclusion of the war between Mexico and the United States (where Mexico was forced to cede more than half its territory) and the war with France. The Federal Republic lasted almost 17 years and was ruled by 14 presidents (of which only José Joaquín de Herrera completed his term). 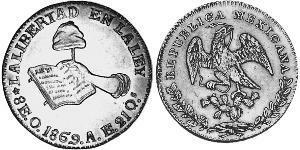 The Republic was dissolved on July 10, 1863 with the decree of a change of government to a model of hereditary monarchy; this began the Second Mexican Empire, ruled by Maximilian I. 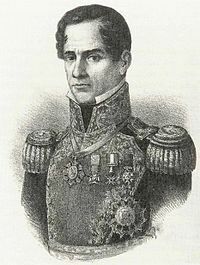 In the midst of war with the United States, Mariano Paredes y Arrillaga staged a coup against the government of interim President José Joaquín de Herrera. Shortly afterwards, the Congress appointed him as interim president; the vice presidency went to Nicolás Bravo. On July 28, 1846 Mariano Paredes left the presidency to command the army in battle against the Americans, and vice president Bravo took office. On August 4 the federalists (headed by José Mariano Salas and Valentín Gómez Farías) led an uprising, causing the resignation of President Bravo. Mariano Salas took office as provisional president on August 6; on August 22, he reestablished the 1824 Constitution and called an election. With the constitution again in force, centralism ended and the federal system was restored. The war between Mexico and the United States officially began on May 13, 1846 (when the United States Congress declared war on Mexico), but there had already been battles before that date. Mexico, in turn, declared war on the United States on May 23. After the declarations of war, US forces invaded Mexican territory in Tamaulipas, Nuevo León, Coahuila and Alta California, while at the same time blocking the ports of Tampico, Carmen, Guaymas, Mazatlan and San Blas (among others) and occupying Santa Fe, San Diego and Los Angeles. The main US force (led by Zachary Taylor) continued through to the Rio Grande and into Mexico, defeating the forces of Pedro Ampudia in the Battle of Monterrey. On December 24, the Congress declared Antonio López de Santa Anna acting president and Valentín Gómez Farías vice president. Gómez Farías assumed the presidency in place of Santa Anna, who was fighting the US. After the battles of Angostura, Padierna, Churubusco and Molino del Rey, the Castle of Chapultepec was defended by young cadets who became known as Niños Héroes. During the assault, the castle generals (Mariano Monterde, director of the Military College of Mexico and Nicolas Bravowere) were taken prisoner. The fall of Chapultepec had two immediate consequences: the US occupation of Mexico City and the resignation of Santa Anna from the presidency on September 16, 1847. Following the resignation of Santa Anna (and under the law of the time), Manuel de la Peña y Peña (president of the Supreme Court) assumed the office. On September 26 he established the seat of federal power in Toluca and (soon afterwards) in Querétaro, where Congress convened. On November 11, De la Peña left office to serve as chancellor and negotiate peace with the United States Congress; General Pedro Maria Anaya was appointed substitute president. Manuel de la Pena y Pena called for elections; Congress chose José Joaquin de Herrera, who took over as president June 3, 1848. Herrera used the money for war damages stipulated in the Treaty of Guadalupe Hidalgo to pay foreign debt, pacify the country and pay salaries. He also achieved re-annexation of Yucatán, which was in a precarious situation caused by the Caste War (which led to the government of the Republic of Yucatán to offer sovereignty of the peninsula to the United States). Congress also sent a request for the creation of the State of Guerrero, and contracted the construction of the Mexico City-Veracruz railway (the first in the country), and awarded another contract for a telegraph line between Mexico City and Puebla. Mariano Arista was elected in the disputed election of 1850, which had involved former presidents Manuel Gómez Pedraza, Nicolás Bravo and General Juan Nepomuceno Almonte. Herrera was the second president of Mexico to complete his term, and handed over power to Mariano Arista on January 5, 1851. Arista attempted unsuccessfully to overcome bankruptcy and encourage mining. Agriculture and industry were almost nonexistent. British and American claims were financed on bonds and building permits, and Arista had to overcome several uprisings against his rule. However, the telegraph proceeded to the city and the port of Veracruz and the same route was granted to a railroad company. The financial plight sparked a revolt that aimed to return Santa Anna to power. Unable to cope due to lack of resources and the refusal of Congress to grant him extraordinary powers to govern, Arista resigned the presidency on January 5, 1853. In his resignation letter, Arista asked Congress to name Juan Bautista Ceballos (president of the Supreme Court) to assume the duties of government during the organizing of elections. After a quick vote, Congress named Ceballos interim president. He ordered the dissolution of both houses of Congress, which were plotting for the return of Santa Anna. Members of Congress instigated the garrison in Mexico City, which rose in support of Santa Anna and sparked riots. Ceballos resigned the presidency on February 7. 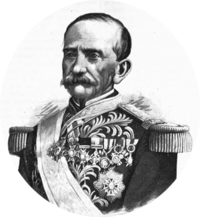 A military group appointed Manuel Maria Lombardini acting president; Lombardini arranged the return of Santa Anna, organized a sham election and on March 17, issued a decree making Santa Anna president. Before Lombardini left office, a decree was issued declaring Santa Anna "Captain General of sea and land, with absolute powers". Lombardini left the presidency on April 20, which began the dictatorship of Santa Anna. Antonio Lopez de Santa Anna again assumed the presidency on April 20, 1853 at age 59. Two days after using his extraordinary-powers decree, the Rules for the Administration of the Republic were put into effect. These rules eliminated any control over the executive. Decree of October 16, 1853: Established the Territory of the Isla del Carmen. During 1853, Santa Anna issued several other decrees arranging for printing, reordering public finances, expropriation, the right to work, the restoration of the Society of Jesus and the return of their former property held by the government (with some exceptions, such as the Colegio de San Ildefonso and military schools). On December 16 he issued the most controversial decree of his dictatorship, stating that the nation would continue with "extraordinary powers" as long as necessary and he would be addressed as "His Most Serene Highness". On December 30 Santa Anna signed the Gadsden Purchase, selling 76,845 square kilometres (29,670 sq mi) in the states of Sonora and Chihuahua to the United States for 10 million pesos. On January 9, 1854, he imposed a tax levy on doors and windows and on February 23, a tax on the exterior lights of houses. Because of this series of decrees and the sale of national territory, on March 1 General Florencio Villareal proclaimed the Plan of Ayutla (which would remove Santa Anna from office). This marked the beginning of the Plan of Ayutla and the end of Santa Anna's rule. Preoccupied with the revolt, Santa Anna issued a new series of decrees. Among these were exceptions to the tax on doors, windows and lights, prohibitions on a Republic and attacks on the government, and decreeing the death penalty for those with a copy of the Plan of Ayutla who would not surrender to government troops. He then conscripted and led an army of 6,000. Confronted in Guerrero against the army of Ignacio Comonfort, Santa Anna's army was decimated in large part by the defection of soldiers forced to fight. He decided to return to Mexico City; on his way back, he punished several people who had supported the Plan of Ayutla. In 1853, he sponsored a contest for the best "Ode to the Motherland". On September 15, 1854, in the midst of the Revolution of Ayutla, it was presented in the National Grand Theatre (then known as the Gran Teatro de Santa Anna) as the national anthem. In 1855, despite repression and terrorism against civilians Santa Anna considered suspects, the Ayutla Revolution was gradually conquering the states of the Republic. 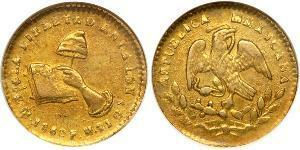 On August 12, Santa Anna resigned the presidency and fled to Colombia. He tried unsuccessfully several times to return to political life. He offered his services to Benito Juárez, to the French during their war with Mexico and to Maximilian I, but all refused. Santa Anna tried to return to Mexico during the Second Empire, but was arrested in Veracruz and deported. He lived a while in St. Thomas, and again tried to return to Mexico after the triumph of the Republic. Juárez banned him on pain of death, but he landed in Yucatán and was arrested July 30, 1867. Although the charges against him carried the death penalty, the court-martial that tried him in the Castle of San Juan de Ulua sentenced him to eight years in exile. The judges who sentenced him spent six months in prison for similar charges. Santa Anna lived in St. Thomas, Puerto Plata, the Dominican Republic, and Nassau. Before his sentence, he unsuccessfully requested amnesty several times from President Sebastian Lerdo de Tejada. Santa Anna died in Mexico City on June 21, 1876. After the fall of Santa Anna, Martin Carrera was named interim president by the military garrison of Mexico City on August 15, 1855. When Carrera resigned, Romulo Diaz de la Vega (military commander of the capital) took over as de facto president on September 12. On October 4, liberals under the Ayutla Plan named John N. Álvarez interim president. The most important act of the Álvarez government was the convening of a Constitutional Assembly to draft a new constitution that would replace the Constitution of 1824. The Constitutional Congress of 1856 convened amid a clerical uprising on February 18, 1856 with a speech by President Ignacio Comonfort (who had replaced Alvarez on December 11, 1855). Topics discussed were the attribution of powers, division of territory, individual rights and freedom of worship. The Constitutional Congress divided into two parties, the liberals and the conservatives. Among the liberals were former President Valentín Gómez Farías, Santos Degollado and Melchor Ocampo. Among the conservatives were Antonio Aguado, Mariano Arizcorreta and the governor of Durango, Marcelino Castañeda. The Constitution of 1857 was a watershed in the history of Mexico. It maintained the basic principles of political liberalism: equality before the law and abolition of the privileges of the army and the church. It claimed to uphold individual and political rights. The delegates, under pressure from conservatives, were unable to establish the principle of freedom of religion. Still, the church was strongly opposed to the Constitution and threatened to excommunicate all public officials who took the oath. This atmosphere of discontent led to the liberal-conservative civil war known as the Reform War. The Constitution of 1857 approved several changes in the political division of the Mexican territory: the merger of Nuevo León and Coahuila, the creation of the state of Guerrero, three of the four federal territories and the free states of the federation. The only federal territory was Baja California. The Federal District (Mexico City) was called the Valley of Mexico State, but only if the Federation retained the power to move it to another site. On February 26, 1864, Nuevo León was separated from Coahuila and regained its status as a sovereign state. On November 23, 1855 President Alvarez issued the Decree of Law on the Administration of Justice and the Courts Organic Federation (better known as the Law of Juarez). It abolished church and military privilege, and declared all citizens equal before the Catholic Church. The Church almost immediately protested against the law, arguing that it "directly undermines the rights of the church". Several bishops declared that they would abide by the Law of Juarez, and demanded that the law be revised by the Vatican. Opposition to this law resulted in several popular uprisings, such as the Plan of Sierra Gorda (which, among other things, sought the creation of the State of Iturbide) and the Zacapoaxtla Plan (which the government did not recognize). On January 27, 1856 Comonfort decreed a Civil Registry Law (by which the government would record births, deaths and marriages), and on June 23 decreed a law confiscating property owned by corporations and the church (better known as the Law of Lerdo). This law required civil and ecclesiastical bodies to sell their houses and land, and prohibited the church from purchasing property (except that necessary for worship). The Catholic Church protested against both laws, and began inciting people to civil disobedience. The 1857 Constitution was liberal, and divided Mexican society into two groups. The liberals, known as "pure" or "red", were largely composed of former insurgents, landowners, Creole merchants and artisans. They sought to establish a regime of freedom and equality among citizens. The conservatives (known as the Moche) were composed of civilian and military officials, lawyers, the Spanish and most of the clergy. They sought to preserve the social and political institutions inherited from the colonial era. On April 11 Comonfort enacted a law on rights and parish perquisites (better known as the Law of Churches). This law prohibited the charging of fees, parish perquisites and tithing. This was the last of the three reform laws which threatened the privileges of the Catholic Church. On September 16, 1857 the new Constitution came into force. Legislative power was integrated on 8 October, with the executive branch headed by Ignacio Comonfort (as constitutional president); the judiciary, headed by Benito Juárez as president of the Supreme Court, started on December 1. The new constitution was rejected by a large part of society, which had the support of the clergy and the army. Comonfort, aware of the limitations imposed by the new regime, proposed reforms to strengthen the government and mitigate "radical" measures; however, Congress rejected them. Given the delicate situation, Félix Zuloaga and other generals convinced Comonfort to convene another congress to draft a new constitution more in keeping with the customs of the nation. On December 17, Zuloaga proclaimed the Plan of Tacubaya. Comonfort joined the Plan of Tacubaya, which began the three-year war. The Plan of Tacubaya demanded the repeal of the Constitution of 1857, the abolition of Ignacio Comonfort's permanence in office with absolute powers and the convening of an extraordinary congress, which would develop another charter to "guarantee the true interests of the people". On December 19, Comonfort published a manifesto explaining the reason for his coup d'état. Under the Constitution, Supreme Court president Benito Juárez had been the constitutional interim president since December 18. Juárez took office that day and was imprisoned along with Isidoro Olvera, president of Congress. The states of the country were divided into those who supported the Plan of Tacubaya and those defending the constitutional order. Conservatives, meanwhile, lobbied for repeal of the Comonfort liberal reforms; he refused. On January 11, 1858, Comonfort dissolved Congress and released Juárez. He tried to seek reconciliation with the liberal wing, and armed clashes took place against the conservatives. The Zuloaga brigade rebelled, and called for reform to the Plan of Tacubaya with Comonfort removed as president. Félix Zuloaga was named president that day; Comonfort, ten days afterwards, declared himself defeated and went into exile. 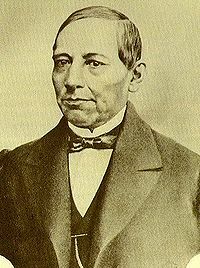 Benito Juarez (who, according to the Constitution of 1857, had been acting president since December 18) restored a constitutional government in Guanajuato on January 19, 1858. The states supporting the constitutional government recognized Juarez as the legitimate president of Mexico. 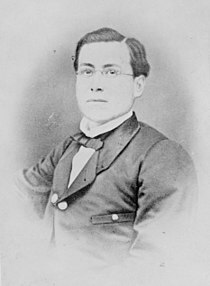 Félix Zuloaga, declared president by a board of representatives of the states supporting the Plan of Tacubaya, was established in Mexico City. The progression of conservative troops forced Juárez to move to Guadalajara on February 13. When Guadalajara was attacked, he moved to Colima on March 20. Since Juárez needed a place controlled by liberals and resources to support his government, he sailed for Panama and on to Veracruz. At first, the conservatives had the advantage; they were in Mexico City, and had the support of the clergy and the army. The liberals lacked a professional army, and the states with militias supported Juárez alone. The United States proposed to both governments (liberal and conservative) the purchase of Baja California, which was rejected by both. Finally, the United States recognized the government of Juárez on April 28, 1859. In July, he issued three decrees from Veracruz: the law nationalizing church property, the Civil Marriage Act and the organic law governing civil registration. The liberals supported the law under its new political banner, and emphasized the religious nature of their struggle. The second half of 1859 was the same as the previous year: winning battles, the conservatives and liberals quickly recovered. On the conservative side Félix María Zuloaga, who was overthrown by Manuel Robles Pezuela's Christmas Plan, was restored to office in January 1859; Miguel Miramon was released in February. Lacking financial resources, in September the Conservatives signed the Mon-Almonte Treaty (by which Spain recognized the conservative government as the legitimate government of Mexico). In December the liberals, contesting the usurpation of the Nationalization Law, signed the McLane-Ocampo Treaty (which virtually made Mexico a protectorate of the United States) for $4 million. Juárez, receiving $2 million as an advance payment and military aid, was to capture the maritime squadron off Veracruz Miramon. However, the treaty was not approved by the United States Senate; Juarez received the money (and military aid) without giving anything in return. The civil war, which had exhausted and impoverished the country, wound down in 1860. On December 4 Juárez decreed laws on religious freedom, which allowed each person to be free to practice and choose their religion and forbade ceremonies outside churches. On November 6, Juarez called for elections of deputies and a president of the republic. Liberal victories began in the battles of Peñuelas and Silao. Liberals won decisively at the Battle of Calpulalpan on December 22, in which the conservative army disintegrated. The liberal army made its triumphal entry into Mexico City on January 1, 1861, which marked the end of the War of Reform. The civil war was costly and had a negative balance on all sectors of the Mexican government, especially agriculture and the diplomatic arena. Both sides acted in ways affecting Mexicans and foreign interests such as forced loans, confiscations, murder and debts from foreign powers. The most important deal was that of Miguel Miramon, who signed a loan of 15 million pesos (of which only received 750,000; this would be part of the claim as the debt owed to England). When Juárez occupied Mexico City he expelled the representatives of Spain, Guatemala and Ecuador; the papal nuncio, Archbishop of Mexico; and the bishop of Michoacán for openly supporting the conservative government. The end of the War of Reform was not the end of the civil war. With the conservative army decimated, it become a guerrilla operation under the leadership of Leonardo Marquez, who in June 1861 murdered Melchor Ocampo, Santos Degollado and Leandro Valle. Juárez won the elections held in November, and took office as constitutional president July 15, 1861. The country's precarious economic situation led Juárez to suspend foreign debt payments for two years. Napoleon III called Spain and the UK to a meeting in London to discuss a joint stance against the government of Mexico. On October 31, 1861, the three countries signed a document known as the London Convention, which blocked Mexican ports and authorized customs to press for the payment of debts. In the face of the external threat, the Congress reluctantly granted extraordinary powers to Juárez on December 11. When foreign ships arrived in Veracruz Juárez offered no resistance and allowed them to disembark at the port, seeking to resolve the conflict diplomatically. Foreign Minister Manuel Bent met with commissioners of the foreign powers; Spanish and English claims were considered "reasonable". Both nations signed treaties with Mexico, and by so doing accepted the temporary suspension of payments in April 1862. During 1862, battles between Mexico and the French continued. 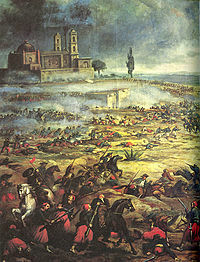 The battles of Dry Canyon and Cerro del Borrego followed the Battle of Puebla; both were French victories. After the arrival of reinforcements from France was the siege of Puebla, in which the city fell to the French on May 17, 1863. After the fall of Puebla, French troops went to Mexico City. On May 31 Juárez and his cabinet left Mexico City and moved to San Luis Potosí and began his "errant government", which finally settled in Paso del Norte (now Ciudad Juárez). On June 1, 1863 garrison commander General Bruno Martinez issued a manifesto favoring French intervention in Mexico and recognizing Frédéric Forey as ultimate authority in the country. José Mariano Salas, former president of Mexico and restorer of the Federal Republic, took over Mexico City from June 1–10 (when French troops occupied the capital). On June 16, General Forey decreed the formation of a Superior Board of Governors, which on June 24 named a triumvirate to take over the executive branch: Juan Nepomuceno Almonte, Jose Mariano Salas and Pelagius Antonio de Labastida (who, due to his absence, was temporarily replaced by John B. Ormachea). On July 8, a 215 Notables Assembly was installed (in conjunction with the High Board of Government). On July 10, it established a monarchy and offered the crown of empire to Maximilian of Austria. This decree marked the end of the Second Federal Republic, beginning the Second Mexican Empire. On July 11 the board consisted of Almonte, Salas, Labastida and the Regency of the Empire, which ruled until the arrival of Maximilian in Mexico. On October 3 at the Castle of Miramar, the Mexican delegation (headed by Jose Maria Gutierrez de Estrada, Juan Nepomuceno Almonte and Miguel Miramon Maximilian) was read the official request of Mexican monarchists for occupation of the throne of Mexico. Maximilian accepted the crown of the Mexican Empire, and arrived in Veracruz on May 28, 1864. He went to Mexico City with his wife Charlotte, where he was crowned on April 10, 1864 in the Metropolitan Cathedral. In the nearly 17 years of the Second Federal Republic there were 14 presidents in 18 governments, of which only José Joaquín de Herrera completed his term. Herrera, Arista, Comonfort and Juárez were the only four constitutional presidents during this period (although two of them, Comonfort and Juárez, began their governments as interim presidents). Interim President José Mariano Salas handed the presidency to vice president-elect Valentín Gómez Farías on December 23, 1846, who took office in place of Antonio Lopez de Santa Anna (who was fighting the Americans). On March 21, 1847, Santa Anna returned to Mexico and dismissed Gómez Farías, who went into exile. On April 1 Santa Anna had Congress set aside the vice presidency, and left the presidency to Pedro Maria Anaya on April 2. Anaya gave the presidency back to Santa Anna on May 20, when he left to fight the Americans. Santa Anna resigned the presidency on September 16, and fled the capital when U.S. troops occupied Mexico City. Following the resignation of Santa Anna, Manuel de la Pena y Pena (president of the Supreme Court) became president. De la Peña gave the presidency to Pedro Maria Anaya on November 13, when he left office to negotiate peace with the United States. Anaya resigned the presidency on January 8, 1848, refusing to cede territory to the United States, and de la Pena y Pena took office the same day. Concluding peace treaties with the United States, de la Peña called an election in which was elected José Joaquín de Herrera, who took office on June 2. Herrera concluded his term, and handed the presidency to President-elect Mariano Arista on January 15, 1851. Arista resigned the presidency on January 5, 1853, when Congress denied him "extraordinary powers" to rule the country. On January 6, Juan Bautista Ceballos (president of the Supreme Court) assumed the presidency in place of Arista. Ceballos resigned on February 8; Manuel Maria Lombardini served as president de facto until April 20, when Lombardini granted to Santa Anna "extraordinary powers" to rule and handed the presidency over. Santa Anna ruled as dictator until August 12, 1855, when he was overthrown by the Revolution of Ayutla. Martin Carrera, president since April 15, gave the charge to Romulo Diaz de la Vega on September 12. Diaz de la Vega left office on October 3; on October 4, John N. Álvarez became president. Alvarez, after calling the election of a constituent congress, handed the presidency to Ignacio Comonfort on December 11. Comonfort ruled as interim president until October 31, 1857, and from December 1 as president. After ignoring the Constitution of 1857 and supporting the Plan of Tacubaya, Comonfort ceased to be president December 17. Under the Constitution the president of the Supreme Court, Benito Juárez, was acting president beginning on December 18; however, he did not set up his government until January 19, 1858 after being released. Juárez was the constitutionally-elected president until July 18, 1872, keeping pace with presidents, presidents recognized by conservatives, the regency of the empire and Maximilian. Since most of Juárez's rule was marked by civil wars and foreign invasions, he did not always have authority over the entire Mexican territory. However, even during the Second Mexican Empire Juárez was recognized as President of Mexico by republican liberal forces; they finally defeated the empire, and restored the republic. Juárez is recognized as president from December 18, 1857 to July 18, 1872. The Plan of Tacubaya, which did not recognize the Constitution of 1857, originally recognized Ignacio Comonfort as president of Mexico. Comonfort was recognized by conservatives until January 11 of 1858, and resigned on January 21. Félix María Zuloaga was recognized as the conservative president on January 11; he formally assumed office on January 23, but was ousted by the Christmas Plan on December 24 and replaced by Manuel Robles Pezuela. Pezuela Robles remained conservative president until January 21, 1859; on January 24, Zuloaga resumed office. Zuloaga held a second term until February 2, when he was replaced by Miguel Miramon. Miramon (a conservative) left the presidency in the hands of José Ignacio Pavón on August 13, 1860—a position he held only two days, since Miramon resumed the presidency on August 15. Miramon ruled until December 24, having a rotating presidency with Zuloaga. Zuloaga, assisted by several military conservatives, became president of a conservative faction that was divided by internal conflicts and his term ended August 13. Despite being defeated by the liberals, the conservatives continued to recognize Zuloaga as president. On December 28, 1862, his term ended; by ending with a conservative government, this would prepare the way for what became the Second Mexican Empire. Before filing the change of government in the Federal Republic to a monarchy, a meeting of conservatives supported by the French army appointed a triumvirate to take on the executive duties of the country. This was composed of Juan Nepomuceno Almonte, Jose Mariano Salas and Pelagius Antonio de Labastida (and as interim, John B. Ormachea). 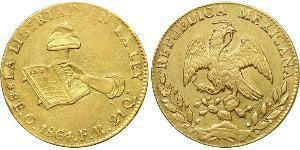 This triumvirate ruled from June 24 to July 10, 1863, and from July 11 became the Regency of the Empire. ^ "Constitución Federal de los Estados Unidos Mexicanos" (in Spanish). ^ "Portal Estado de Guerrero" (in Spanish). ^ "Portal Gobierno del Estado de Tlaxcala" (in Spanish). ^ "el Comentario" (in Spanish). ^ "Gobierno del Estado de Yucatán" (in Spanish). ^ "Información turística INEGI" (in Spanish).